Season: Shows the season in the current state you are in. Temperature is also shown for the current location you are at. 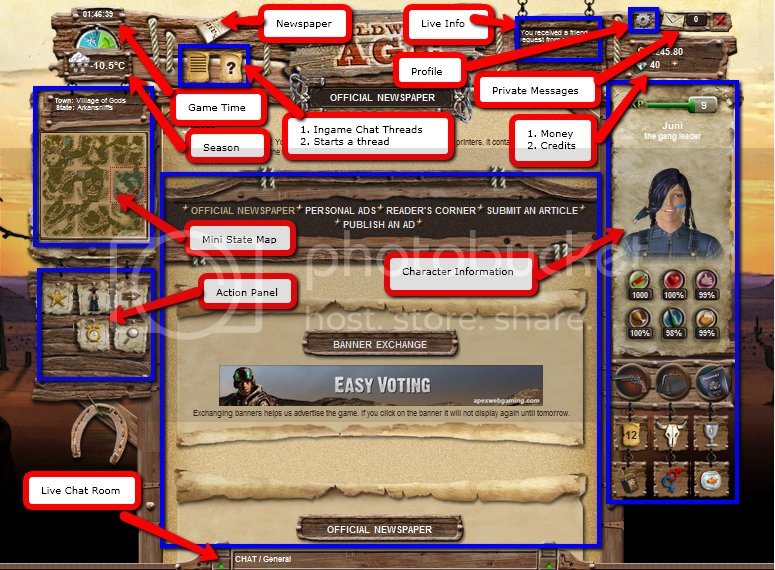 Newspaper: Official news by Admins and personal ads and stories by players can be found here. Ingame Chat threads: Discussion/help threads for players. 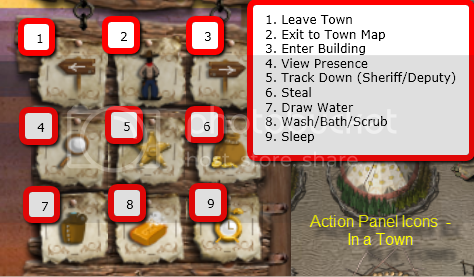 Mini State Map: Shows the current location (state) you are in - clicking it brings you to the travel map. 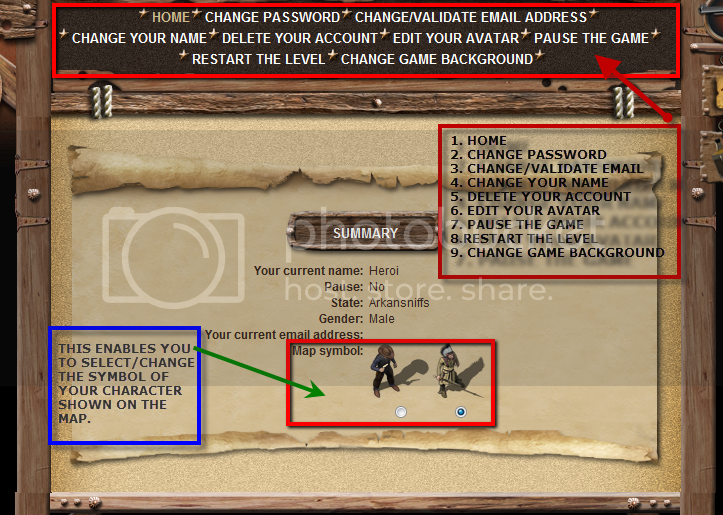 Profile: For the making of main character changes like login/password changes. Private Message: Your inbox - indicates number of un-read PMs and will flash when they are un-read. Live Info: Real time broadcasted message. Action Panel: Choice of action available for your character to perform at your current location. Account/Profile Options and other miscellaneous questions. My page does not load right - what can i do ? I'm pausing my account, but do my items expire in the time I'm away? The items you have in your home and bag will be paused, and won't expire. The items you're trying to sell on the market etc do expire! 1. 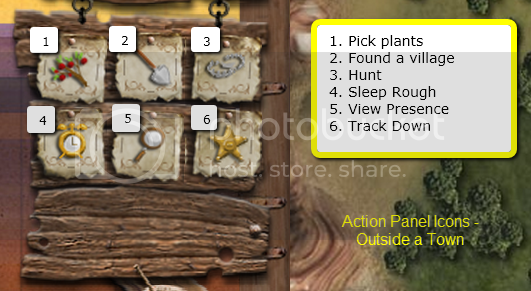 Home - Allows you to change the character's symbol that appears on the Map. You can choose either a cowboy/girl or Indian boy/girl icon. 2. Change password - You can change your password here. 3. Change/validate you email address - Allows you to change your email address that you have registered with. Validating your email address enables your to receive your daily free gift and sends you a password reminder should you forget password. 4. Change your name - This allows to change the name of your character. 5. Delete you account - You decided you don't wish to continue with the game, you can delete your character with this option. 6. Edit your avatar - Customise your avatar to your liking with the abundance of choices! 7. Pause the game - This lets you pause your character for a minimum of 3 days. A handy option when you are going way on holidays or when you you feel like you need a break from the game etc, without letting your character die off! 8. Restart the level - This resets your character back to the beginning! Be very sure that you really want to do this! 9. Change game background - This allows you to change the background picture of the game play.